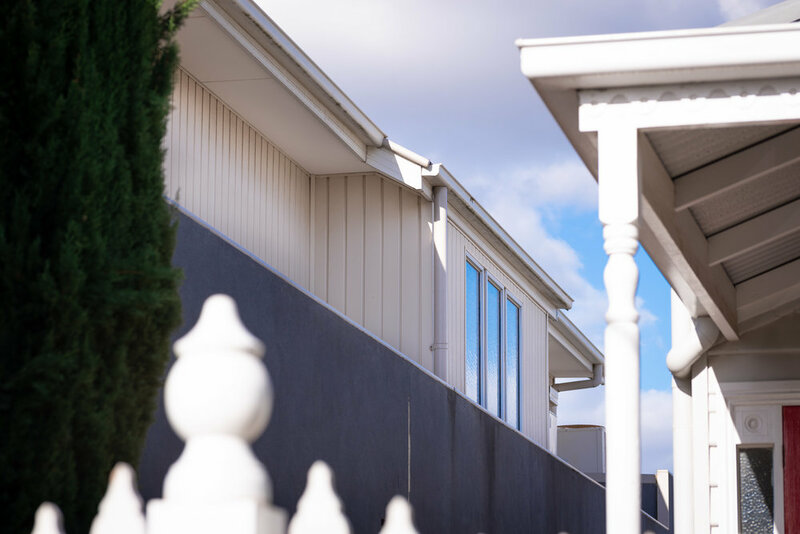 Kaycan Insulated Vinyl Cladding provides the look of a traditional weatherboard home, but with none of the drawbacks. With an industry leading Liftetime* warranty and added insulation benefits, you really can't go wrong. Our weatherboards come in various different profiles to suit your design wants and needs. Other than the profiles listed below we can source other profiles/materials to suit your needs. This is the most common profile that we sell, suitable for anyone who wants to revitalize an old weatherboard house or wants the traditional weatherboard look without the hassle of expensive maintenance. An closer look at our traditional horizontal insulated vinyl weatherboard. Here you can see how the hook and screw system works and also a closer look at our dense insulation. Colour featured: Slate Grey. An example of our traditional horizontal insulated vinyl weatherboard on a home in Wheelers Hill, Victoria, Australia. This home was a new build in 2018, photos taken in 2018. Colour Featured: Slate Grey. An example of our traditional horizontal insulated vinyl weatherboard on a new home in Geelong. This is a perfect example of how vinyl weatherboards can be used to compliment and finish the look of a brick home. Colour featured: Sandalwood. The vertical profile again can be used on any home exclusively, but is also very popular either in combination with our traditional profile vinyl weatherboard. It is also a very popular choice in beach communities. As seen in one image below, it is also very common that we will use a vertical weatherboard for eave lining on the home, rather than leaving bare cement sheet, providing a more rounded and finished look overall. An example of our vertical insulated weatherboard profile. Here both the walls and eaves are clad in vertical cladding, providing a more polished look than bare cement sheet. This is a beach house located in Portarlington, Victoria, Australia. 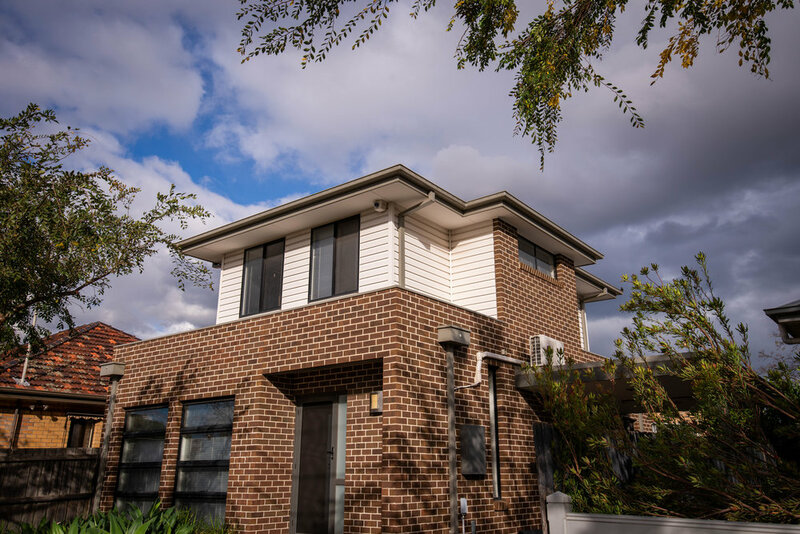 An example of our Vertical insulated vinyl weatherboard on a home in Ascot Vale, Victoria, Australia. This shows the versatility of the product and how it can work in various different environments. An example of our Vertical insulated vinyl weatherboard on a home in Ascot Vale Victoria, Australia. This shows the versatility of the product and how it can work in various different environments. The insulating foam in combination with our weatherboard will give you a R-value of 1.5. This value is higher than other products such as cement sheet and timber and will help to ensure your home is as energy efficient as possible. *R-Value is a measurement of insulation benefits. All of the Insulating foam that we use is manufactured with fire retardant materials, helping to ensure your safety in the worst of circumstances. The foam will burn when in contact with a flame as any other organic material, but will self extinguish once the flame is removed. Due to the nature of the insulation materials, water does not affect the polystyrene and as such it will not rot, nor will the weatherboard. This lack of deterioration means you will enjoy the insulation benefits of the product for the lifetime of the product. Kaycan Insulated Vinyl Weatherboards are maintenance free in almost every way. The only maintenance required to keep your home looking as good as new, even 20 years later is a washing every once in a while. Washing the dirty weatherboards from the top down with a hose or pressure cleaner once or twice a year is generally all that will be required to keep your home looking brand new. Copyright © 2018 Kayline Australia PTY. LTD.